I received this photo from a friend recently, after B and I announced our engagement. 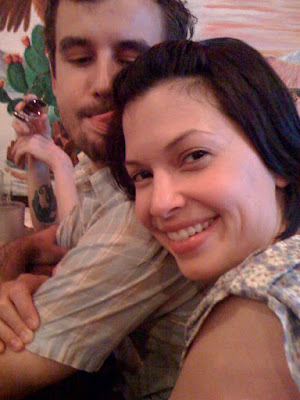 Don't get me wrong, I'm thrilled to be marrying this man, but seriously, what's up with the licking? Can someone explain this phenomenon? Please?! That's so cute! What a sweet guy :-) You're a luck girl! nikki- hahaha, i hadn't even noticed that. it is a little scary! those arms protruding are wicked funny! so is the licking. it's so unexpected, that's why it's so funny. congratulations on your engagement and future plans! new commenter on your blog. i was a lurker. lol. congrats and men are so silly at times, aren't they? my husband does this a lot. he loves you. pure and simple. he's a cute and possibly does not like his picture taken a true photo sabotage! Ha ha ha! My husband does the same thing. I thinj its adorable! He can't get enuf of u! Cngrats again! Haha! This is adorable!!! I personally think it's cute but it's the quirky things about our significant others that we love or drive us crazy. Ha ha, that is hilarious and so cute at the same time! Congrats to you both!! Cogratulations to you both...thats fantastic news...as for the licking...Hmmm..I think its a thing that most people do ..when they really dont know what to do for a pose ...so the tongue lick does the trick..lol...I guess? P.s. cannot explain ! my buddy does the same! My mans does this and even sillier things in photos!